Giving new meaning to the term "away game," the UO men's basketball team flew more than 5,000 miles across the Pacific Ocean to play the Georgetown Hoyas at an American army base in South Korea. The sprawling garrison at Camp Humphries is about 55 miles south of Seoul; its personnel are stationed far from home and were eager for the entertainment and distraction a game can provide. The purpose behind the game, played November 7 as part of ESPN's Veteran's Week, was to show thanks to the troops for their service. But UO men's basketball head coach Dana Altman discovered that he and his team could not outdo the outpouring of gratitude received from the troops. "We couldn't get a 'thank-you' in edgewise," he said, "the troops were always thanking us first." The players' time on the base wasn't exclusively focused on fast breaks, rebounding, and three-point shots. The Ducks participated in a number of events, including serving lunch to a line of hungry soldiers. Oregonian Kyle Dunn of Elkton was among them, brimming with excitement. "I can't believe I get to see my star team right here in Korea. My entire family is made up of Duck fans." Senior point guard Johnathan Loyd helped lead a basketball clinic for children. "I love little kids and making them happy," he said. "So being able to put a smile on their faces was a lot of fun." Just before tip-off on game day, a crowd of 2,000 packed the gym, a wall of camo uniforms rising up the bleachers. Cassie and Brian Gaudette waved a sign reading "Home is where the Army sends us, but we're just migrating Ducks!" Brian, a graduate of Willamette High School and an Apache helicopter pilot, was about to see his first live Ducks game. "Having the Ducks here is like getting a little piece of home," he said. A North Eugene High School graduate, Cassie elaborated on the game's meaning in terms familiar to many military members and their families stationed at bases around the world. "Homesickness is a funny thing," she said. "For me, sometimes it comes on quick and out of nowhere and it also comes on like clockwork after about a year away with no visits. We've found it can help to do the small things to make you feel closer to home. A Skype session with Mom, watching a funny video clip of the nieces and nephews on Facebook, or even pulling on our Ducks sweatshirts and watching a game. What a blessing to have the Ducks care enough to come to us!" On the hardwood, Oregon controlled the action throughout, but the Hoyas certainly kept the game exciting. Georgetown's 350-pound center Joshua Smith bulled his way to the rim and jammed home a dunk so powerful it shifted the backboard support structure, prompting a half-dozen servicemen to spring from the stands and reposition the hoop. Cheers followed. One Oregon fan had a duck call and blew it enthusiastically . . . until he caught the lead official's attention and was instructed to put the noisemaker away (apparently a "flagrant fowl"). Other than that, it was all Oregon, with a final score of 82–75. 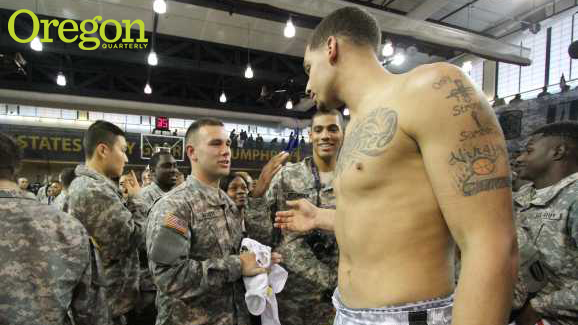 Following the game and trophy presentation, fans surrounded the players at midcourt and, within seconds, the Ducks players spontaneously began stripping off their custom camouflage jerseys and giving them to appreciative soldiers. "There was such a reciprocity of energy; we were thanking them and they kept thanking us. That was special," said Quentin Hagewood, a Cottage Grove native and Black Hawk helicopter pilot. "It's funny that I had to come halfway around the world to watch my hometown team play live for the first time. It's a game I will always remember." The players, too, came away with memories—of another game, another victory, but also, perhaps, something deeper. "I think our team got an eye-opening perspective when they saw that most of the troops were about their same age," said Josh Jamieson, director of basketball operations. "Our guys are focused on going to school and winning ball games and these men and women are preparing to win battles and wars." That new perspective on the part of the players might explain an observation Quentin Hagewood made about the Ducks. "It felt like they were exuding an energy on the court not typical of an average college basketball game," he said. "Perhaps from their excitement at the unique opportunity. Perhaps out of thanks to us for what we do."